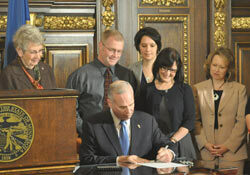 On May 1st Governor Mark Dayton held a bill signing ceremony for this year’s Minnesota education omnibus bill. One noteworthy section of the bill explicitly encourages schools to implement individualized learning programs. Individualization is key to improving learning. Different students have different interests, aptitudes, and learning styles. One might breeze through math but need extra time with reading; another might excel in foreign languages but struggle to grasp concepts of the social sciences. Schools should be free to adapt to the differences in students known intuitively to all parents and teachers. Senator Gen Olson, one of the bill’s authors, invited Ananth Pai, a White Bear Lake elementary teacher who received media attention for his uniquely individualized classroom, to testify. Pai explained: In my classroom I had students at the 10th percentile and the 90th percentile... how could I have any option but to personalize learning for my students? Among the other testifiers were Ted Kolderie, senior associate with EE and Holly Marsh, a student at Avalon School. Technically, the new provision is an addition to the site-based decision making statute. Previously the statute contemplated simply a transfer of authority, with no specific purpose. Now individualization is defined as its purpose. Legislators came to see it can be useful to encourage actions, as well as to mandate or prohibit.